The Rockworth RW1504ST can be considered a medium duty air compressor at a rock bottom price. It was designed as a versatile compressor for contractors and home users to compete with models that are three or four times more expensive. We’re not exactly sure it lives up to expectations. This Rockworth air compressor has twin, horizontally stacked tanks that total 4 gallons. It is a fairly light weight model that is easy to move around the house or the job site. Because it has a twin stack of tanks, the compressor operates efficiently and you are able to operate two air tools at the same time, which is great if you have a couple people working on putting together a deck or putting a new roof on a house. It is portable with a telescoping handle and hard plastic wheels. You can take this little air compressor most places and it weighs under 50 pounds so it is easy to handle. The maximum PSI is 155 and at 90 PSI, you get 2.8 SCFM that will run one framing gun or a couple finishing guns. The motor runs at 1.5 peak horsepower but CFM at 90 PSI is a much more important number. Performance is better than most smaller portable compressors but slightly worse than other compressors in its class. The pump is totally oil free, making your maintenance requirements minimal. You will love the fact that you can run two air outlets at once, so multiple tools can be used. Because it has two different tanks, you can run different tools with different PSI levels. 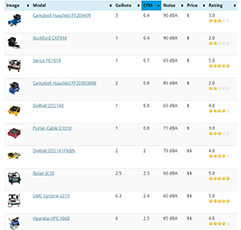 The unit actually runs quite smoothly and the motor puts out an average to above average amount of noise in the same size and relatively close price range. Not exactly quiet enough to brag about, but the Rockworth RW1504ST could be much worse when it comes to noise. 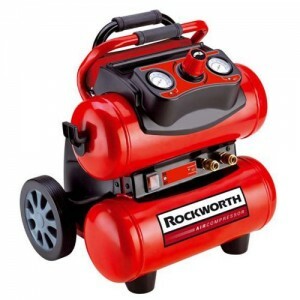 The Rockworth RW1504ST would make for a good first air compressor for around the house or to serve as a backup on the job site. Because of its low price point, you don’t have to worry about any large repair costs should something happen. It would simply make more sense to buy another compressor. Use the RW1504ST to fill tires, work on crafts, or even build a shed in the back yard. While this model is almost always sold as a refurbished unit, it is reconditioned to the exact same standards as new but at considerable savings to you. I’ve personally purchased many refurbished tools in the garage and have never had any issues. If you’re looking for a low cost air compressor with better performance than many of the compact units, the Rockworth RW1504ST may be right for you. While we wouldn’t recommend this model for most professional contractors, homeowners looking at purchasing their first compressor to help with common jobs in the garage and backyard could do worse than this model. For most who don’t NEED 2 tanks totaling 4 gallons, a better and higher quality option might be the Stanley Bostitch CAP1512-OF.